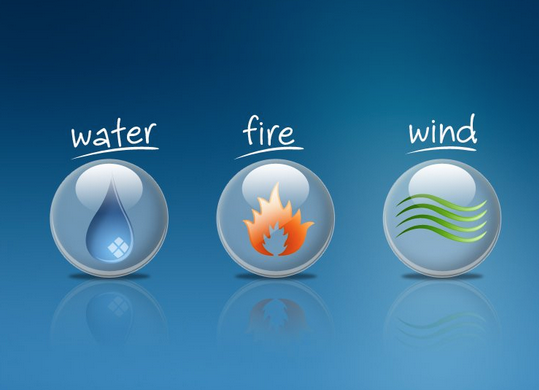 Take some time to reflect on three symbols from these two passages: Water, Wind and Fire. Water is a symbol of chaos and fear for Israel. But Genesis 1 reminds us that God’s spirit hovers over the chaotic waters. In baptism water is a medium of both death and birth. It is the grave into which we plunge in death and the womb from which we rise to life. Wind can be both soothing and damaging. Anyone who has lived through a hurricane or tornado know the destruction that wind can cause. Yet in the midst of a hurricane there is the peaceful calming breeze of the eye. When we have bee blown too hard by the winds of life, we flock to the ocean to sit on the beach and feel the cool, soothing, healing wind coming off the ocean. Fire can both consume a tree or house and yet also purify a metal or ore. The very fire which reduces a magnificent tree into a pile of ashes provides sustenance to the next tree which rises from the very ashes it created. God carries us through the troubled waters of life. God guides us through the windy storms of the world. God protects us amidst the fires burning around us. And we find that on the other side of water, wind and fire, we are changed. Transformed. Made new. Birthed into new life from the watery womb. Blown into a new experience by the spirit filled winds. Refined and purified by the fiery furnace. The images within these passages in Isaiah and Luke remind us that baptism is about belonging and becoming. Not exclusively just those two things, but certainly inclusive of these two crucial Christian ideas – belonging and becoming. We belong to God and to one another. Baptism is a ritual that marks us as belonging to the family of God. It is a rite that binds us together as a church community, a Christian community, a family of faith. In a very real and also very symbolic way it enacts our death to one way of living and our birth into living the way of God, a way of life which we practice by following Jesus. And in this way baptism moves from belonging to becoming. As we acknowledge our belonging to the family of God through baptism, we also engage an act that beckons us to become more than we are, to fulfill all the beautiful and creative potential that God has imbued us with. Through baptism we are marked as belonging to God and we begin the journey of becoming all that God beckons us to be. Through baptism we become someone new. Not that we are changed from who we are into someone completely different. Rather, like a bath, the dirt is washed away from us. As the waters wash over us they fill out pores as cleanse us….in a very real sense and in a symbolic sense. But, people have too often read this passage in Luke to be about separating righteous people from unrighteous people, believers from non-believers, faithful from unfaithful. But that misses the point of the metaphor of wheat and chaff. The wheat and chaff come from the SAME plant. To separate the chaff from the wheat is to separate the good of our lives from the not so good, the useful from the useless, the productive from the unproductive, the substance of our lives from the unsubstantial, that which can give life from that which is already dead. So, this passage is not about heaven and hell, not about separating the saved and unsaved. It is about separating within us the chaff in our lives which needs to be burned away so that the wheat of our lives may remain. That, my friends, is part of the process of salvation: acknowledging through water that you belong to God and becoming all that God hopes for you to be by allowing the wind and fire of God to burn away the chaff of your life to leave that which is good and fruitful. This is how God saves us: through water, wind and fire. Jesus showed us the way. And he beckons us to follow him.